A more recent critic, Hannah Arendt, criticizes technology on the basis of a different distinction than means vs. ends. She counterposes two perspectives on the story of human life: the first is characterized as “work and action”, and the second as “labor and consumption”. What “work and action” means is a bit vague, but the point is that both work and action are noble and humanizing pursuits. What is available to us in our technological age, however, is “labor and consumption”, that is, the essence of work as unpleasant toil which merely provides the resources for a consumptive existence. Both halves of this second mode contribute to a lack of meaning and are dehumanizing. Borgmann’s reaction to Arendt is measured; he appreciates the argument but thinks there is a better distinction to be had, one based on the technological goal of “disburdenment”. I take it that he means there is a distinction between two perspectives on life: one (the technological) based on the idea of continual and progressive disburdenment, and another (Borgmann’s) based on some other paradigm (yet to be disclosed). Borgmann’s reaction to the means/end arguments is somewhat more lively, in that he repudiates it as granting too much ground already. 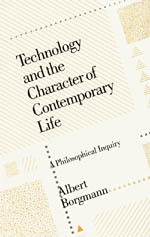 Modern proponents of this kind of argument claim that our technological means have not so much become our ends as overrun our ends, bringing about what Borgmann calls “reverse adaptation”, wherein the technological possibilities are so expansive we adapt our ends to the shape they give reality, rather than vice versa. While not false, framing the discussion in this way leaves it open for the thoughtful technologist to respond that yes, this is a problem, and what is needed is simply a clarification of our ends! What goes unnoticed here is that everyone is inclined to view the state of affairs from within this distinction of means vs. ends, which itself is in fact new, and is itself a product of the rise of technology. One way of talking about the device paradigm on this view is that technology is also in the business of radically redefining our goals or ends. But Borgmann goes beyond this and quotes Thomas Carlyle to the effect that we actually do violence to things when we divide them into means and ends. And unfortunately this is precisely what the device paradigm encourages us to do: “We must recognize that the reduction of the fullness of phenomena in technological measurement and assessment is no more alarming than the common attenuation of the depth of things to commodious surfaces” (61). In other words, this classification of means and ends is a philosophical reflection of the overall pattern of technology, which splits things themselves down the middle, into commodious surfaces on one side and black boxes that produce the commodities on the other. This is deeply worrying, because “commodities allow no engagement and atrophy the fullness of our capacities” (62). So, in sum, others have seen the device paradigm in action and traced its outline, but Borgmann is unsatisfied with other analyses of it, especially when they use the means/ends distinction, which itself is part of what he claims needs to be analysed. Instead, Borgmann wants to give a “paradigmatic” explanation; what exactly that means and how it works will be the subject of the next chapter. Heavy focus in this chapter on the means-ends (as you point out). That said, this is an important point to raise and makes me reflect directly on a few things. One is from a research perspective. Right now there is a tremendous rise in the amount of trace data that is produced via online activity. From a research perspective, I see the ease that can come from potentially ‘armchair researching.’ What I mean by this is that we have social network analytic tools that allow us to capture this vast trace data. However, I’m not always sure that we know the ends that we are hoping to achieve from this data and the technological means. Is it to find actor centrality? The movement of information from one person to another? I do think there are ends emerging in this area but more work needs to be aimed at knowing our ends, almost irrespective of the means. I’m afraid that I sometimes see this in open source as well. Communities that are formed around a particular technology without a clear understanding of what the ends are. There is an expectation that ends will emerge but this isn’t always the case. I think these two cases are what Borgmann calls the reverse adaptation. He makes a great connection between our technological instrumentality and constitutive rationality. In essence, make sure that you attend to the delicate relationship between the two. I do have to make one final note that this chapter and your comments made me think about the metrics work that I’m doing. Making sure that we continue to raise the ‘value question.’ That we are just producing metrics for metrics sake, such that the means (individual metrics) over-determine our ends (whatever those might be). Yes, the point about the ‘value question’ is very important. IIRC, Borgmann views ‘raising the value question’ as a losing battle in the midst of the means/end paradigm of technology. The reason is that the paradigm of technology already presupposes more fundamental ‘values’ (increasing ‘availability’, for example). But these deeper concerns are perhaps more grandiose than necessary to consider for the metrics project. I agree with you that in light of that project, it’s good simply to ensure that there is a reason the metrics are being collected. What is that reason? To determine the health of an OSS project. But do the metrics collected have the potential to determine what it is we mean by ‘health’ to begin with? This is one of the dangers of data collection in general. We end up simply reading reality off the data model rather than using our pre-data notions of reality together with the data to gain insight.